Some of Vincent van Gogh’s works were in sequence with each slightly different from the next, but also very much tied together in theme (1). As new paints and other tools become improved in the 19th Century they also reflect differently on canvas. He did not paint what he saw but tried to paint how he felt about the images (2). This led to some of the most unique paintings in the world. Some of this work comes from the poverty and personality of the painter who sought to recreate a world on canvas. 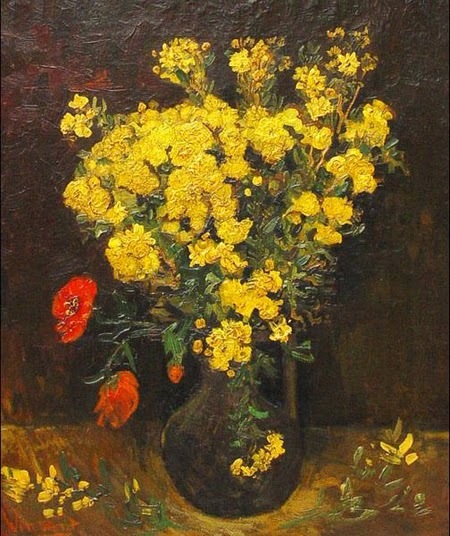 Van Gogh painted flowers on a regular basis. He didn’t have much money to pay models so he would paint inanimate objects instead. It is believed that many of his poppy flower paintings came from images of fields in Southern France. Vincent lived much of his life relatively poor and had to stretch to buy supplies and other items needed to keep his work going. The painting has been stolen twice from Cairo's Mahmoud Khalil Museum. The first time, the painting disappeared in 1978 and recovered in Kuwait (4). It was believed at the time the first theft occurred security was lax. The same problem occurred again in 2010 and is still missing. Authorities thought they found the painting when a couple was boarding a plane to Italy (5). As of today, it is still missing without a trace. Perhaps someday it will show up and we will see the original again.